Despite the twinkling lights strung around it, San Marcos’ Spring Lake was still and dark on the night of September’s inaugural Mermaid Society Ball. The placidity of the headwaters of the San Marcos River stood in stark contrast to party guests standing around the water’s edge, most adhering to the event’s “river chic” dress code, which was varyingly interpreted to include jewel-toned ball gowns, spandex printed with fish scales, and embellished headgear. Underneath the surface, however, the lake was teeming with activity. From its floor, more than two hundred small springs were spurred on by the pressure of the Edwards Aquifer. The world’s entire population of San Marcos salamanders swam through Texas Wild Rice, a rare species of grass that during the daylight can be seen waving underneath the same cool colors that were mirrored by the guests’ attire. Even if Spring Lake’s own glamour was hidden beneath a calm surface, it was indisputably the evening’s honoree. This is because it exemplifies a certain kind of identity San Marcos residents are hoping to resurrect. So too does the Mermaid Society Ball, which was part of a week full of mermaid-themed events that were part of the city’s quest to become the Mermaid Capital of Texas. While the push appears to be a vision of the latest branding efforts from the visitor’s bureau, the citizen-led initiative actually plays into a larger narrative of the historical and cultural significance of San Marcos, a story that has everything to do with the city’s enchantment with mermaids and a didactic parable thousands of years in the making. The city itself is also embracing its mer-legacy by supplying the funds for both a recently completed mermaid mural (on the side of the Root Cellar Bakery, home of the tail-shaped cookies) and the future execution of ten seven-foot mermaid statues that will be displayed throughout downtown. Mayor Daniel Guerrero has announced that he will move forward with officially designating San Marcos as the Mermaid Capital of Texas, which requires state legislation. But the mermaid is more than a manifestation of the city’s cultural identity; it also represents an environmental issue close to the heart of many San Marcos residents. As more people move into the Central Texas region, they use more water sourced from the Edwards Aquifer (more than two million Texans and rely on the aquifer for drinking water and industry). At the same time, less water is making it into that source as land is developed and more impervious ground cover is laid over the aquifer’s recharge zones. Between 2000 and 2010, eighty square miles of cover were added to the Hill Country region with an additional 422 square miles predicted to be added if current trends continue. The San Marcos Springs, so long as they flow, are a comforting indicator of how much water we have reserved. But if the aquifer depletes past a certain point, they will disappear. All of which is to say, a fight to preserve the city’s culture is a fight to preserve the springs as well. San Marcos’s relationship with nature begins with Spring Lake, where the San Marcos River begins, shooting up from the springs and moving through downtown on a 75-mile path to meet the Guadalupe and flow out to the Gulf of Mexico. The area around the spring, which is just north of the Texas State University campus, is thought to be one of the oldest continually-inhabited sites in North America, with sediment cores indicating that humans lived in the area 11,500 years ago. The Miakin-Garza Band, which was recognized by the Eighty-third Texas Legislature as an Indian tribe, believe that the Spring Lake area is where their people originated from, and a banner designed and produced by local artists that displays that creation myth is at what now the Meadows Center for Water and the Environment, a facility that once served as the main building of Aquarena Springs, formerly Texas’s premiere tourist attraction and theme park. And that’s where the mermaids come in. In the fifties, when San Marcos was home to just under 10,000 people, Spring Lake was known as a stage for the enchanting Aquamaids, women dressed as mermaids who performed and picnicked underwater in sequined aplomb. At its peak, the park drew somewhere between 250,000 and 350,000 visitors annually and led the Texas tourism industry, according to former Texas Governor John Connally. 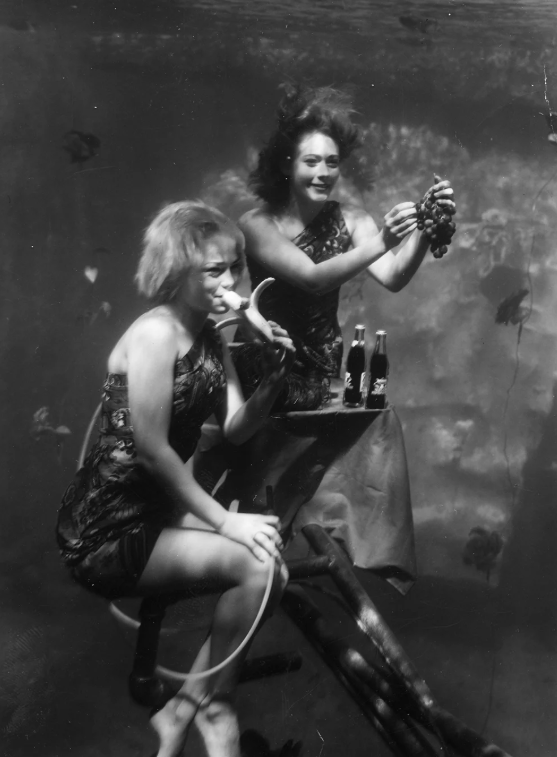 The Aquamaids, who executed a synchronized ballet routine above water before diving underneath to perform and enjoy an underwater picnic, which was always washed down with a glass bottle of Coca-Cola, were the park’s main attraction. The entire performance required a command of balance, with the San Marcos mermaids drawing just enough oxygen from dangling air hoses to breath without floating to the top. Spring Lake’s natural fish population were supporting actors, even if they needed fish food sprinkled during the maids’ picnic to coax them into the performance, which could be viewed in an underwater glass theater that submerged audiences in the springs. Later, an subaqueous, pipe-smoking clown and a swimming piglet named Ralph became crucial draws in the performances (though “Ralph” was really a succession of Ralphs, with a younger model traded in when the older one grew too big to swim). But other attractions offered still more vantage points of the spring’s ethereal beauty. Tourists could coast across the lake in glass-bottomed boats that allowed them to peer down at the water and wildlife below. For a bird’s-eye view, they could hitch a ride on the sky tram, which picked passengers up on one bank and deposited them onto another. There was also the Sky Spiral tower, a key feature of the San Marcos skyline, which carried guests 220 feet into the air and rotated to give them a 360-degree sense of the lake in relation to its surroundings. Shirley Rogers, queen of the inaugural ball, former Aquamaid, and daughter of park founder Paul Rogers, says from up there you had a clear view to the next cities. That was back when those cities were static, rather than creeping out from their centers. That slower pace was eventually outdone by larger, flashier competitors including nearby SeaWorld and Six Flags Fiesta Texas to the southwest. Following years of declining attendance, the park was purchased by Texas State University in 1994 and transformed into the Meadows Center, a research and educational center that now hosts 125,000 visitors each year, many of them regional schoolchildren. The glass-bottomed boats remain, as does a pipe that was first installed to divert water from the main Aquarena stage and is now home to the rare Texas blind salamander. Everything else is gone, and the habitat has returned to a semi-natural state. The lake remains a living time capsule. In its depths, archaeologists have uncovered Clovis points, mammoth teeth, mastodon bone fragments, Spanish spurs, cowboy belt buckles, and fifties-style glass Coke bottles (these being the last indication that mermaids once swam there). In the park’s absence, San Marcos has become known for attractions of a less magical sort. 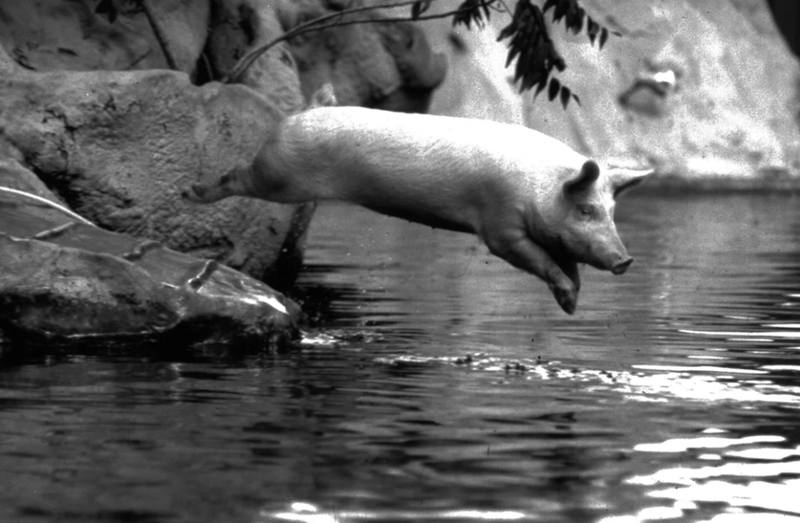 Despite drawing 10 million visitors each year, the nearby Tanger Outlet and San Marcos Premium Outlet, two adjacent factory outlet malls that have a combined 350 stores, hardly inspire the same warm, fuzzy delight of a swimming piglet. And the city’s tubing outfitters, though technically nature-adjacent, have drawn ire among locals in the past for the amount of trash the recreation creates. Those are now the hallmarks of San Marcos for those who aren’t from there. The San Marcos Mermaid Society was created to change that. Moreno is a BISM (‘Born in San Marcos’) or San Martian, depending on which local moniker you prefer. When she moved back to her hometown from Austin two years ago, she found that the San Marcos she remembered—the one best exemplified by Aquarena Springs—had disappeared with the park. And not just because the Aquamaids are no longer performing. Between 2012 and 2015, Texas’s unofficial Mermaid Capital was the fastest growing city in America three years running, ceding this year’s title to the Austin suburb of Georgetown. Spurred on in part by a growing university and its proximity to both San Antonio and Austin, the city has grown by 34 percent in six years for a total of 59,000 residents and counting. Developers are taking notice. In addition to the ongoing construction of housing for a ballooning student population, Amazon is building a 855,000 square-foot distribution center that is expected to create 1,000 jobs when all said and done. In August, Best Buy announced its decision to make San Marcos the location for its first e-commerce sales operation. Among locals, there’s a certain anxiety that San Marcos will get too big, too fast, scaling up only to lose the charm that made it so special in the first place. It’s a fear likely exacerbated by its proximity to the once-weird city to its north. “You have all of this stuff changing around you and the people are changing and the vibe is changing and the economics of our community is changing and the affordability of living here is changing,” says Moreno. As she describes it, the sudden change felt unstable, as if there was no anchor to hold them down. Using the San Marcos Mermaid Society’s goal of community-wide inclusivity as a metric, the parade held the morning after the ball was a huge success. Zombie mermaids, mermaid belly dancers, a merman mayoral candidate, Aquamaids, environmentally conscious mermaids, river creatures, pig-snouted humans—all were accounted for, minus tourist mermaids, who likely found 10:30 in the morning too early for festivities. Following the parade, a festival was held downtown on a bank of the San Marcos River, featuring live music, an art market, and communal picnic area. The longest line of the day was the “live” mermaid photo booth where kids could queue up to have their picture snapped with beautiful, tailed women. In a nearby mermaid grotto, children colored in custom-made coloring sheets that read “The river is beautiful and full of baby mermaids. We have to protect it to keep them safe!” and others that educated kids on the river’s endangered Texas Wild Rice population. The set-up is a simple example of the kind of education-through-mascot push that the Mermaid Society hopes to establish with its initiative. As the organization envisions her, San Marcos’ mermaid is meant to introduce newcomers to the values she represents. Just as the coloring books at SPLASH sought to teach young kids about the delicate ecosystems around them, so the society hopes the mermaid will inspire consideration for the river. It’s hard to imagine a symbol more perfect as a conduit for both culture and environmental appreciation than the mermaid, a creature often depicted as having to learn and adapt to an outside culture (think of Ariel, unsure of how to use a fork or her legs). That makes her the ideal hostess for San Marcos newcomers. And it can’t hurt that she’s endlessly popular, because who doesn’t love mermaids? Part of what makes her so effective an environmental educator is her ability to bring a kind of fantastical allure to a cause that can feel inaccessible for the uninitiated. The San Marcos salamander—an equally reasonable candidate for a river mascot—for example, doesn’t wear flower crowns and isn’t nearly as photogenic. Nobody is lining up to take a picture with one. Across cultures, the mythical creature is employed through storytelling as a way of coping with that which we can’t control—in the mermaid’s case, the life-giving and life-destroying properties of water. In San Marcos’s case, it’s the inescapability of humans and nature coexisting. “It’s inevitable,” says Coley. And, so far, the springs have fared well through changes forced upon them by humans and nature. Through all that it has seen the springs have never stopped flowing, even during the drought of the fifties when surrounding Hill Country springs dried up.